Janet Godwin, right, and her daughter Tatiana Zolman are both U.S. Army sergeants stationed in Grafenwoehr, Germany. They are originally from Colombia and only lived one year in the U.S before deciding to join the military in early 2009. They enlisted one week apart. Photo by Jackie Pennoyer,, USAG Bavaria Public Affairs. GRAFENWOEHR, Germany — It’s not every day you find two young women in vastly different life situations embark on an adventure together in a predominantly male organization. Rarer still, is when a mother with a prolific professional background in international security and her daughter, a recent high school graduate, both decide to capitalize on major life changes and pursue careers in the U.S. Army. 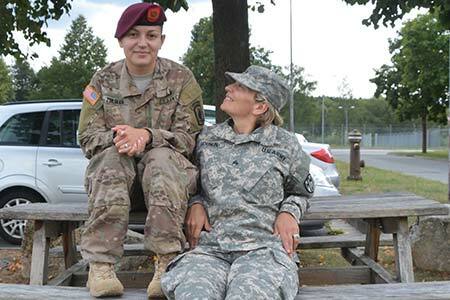 Currently, Janet Godwin and her daughter Tatiana Zolman are both sergeants stationed in Grafenwoehr, Germany. They are originally from Colombia and only lived one year in the United States before deciding to join the U.S. military in early 2009. They enlisted only one week apart. Godwin is serving with the 15th Engineer Battalion’s Forward Support Company and daughter Zolman is assigned to 4th Battalion, 319th Airborne Field Artillery Regiment. Sgt. Godwin, 41 at the time of her enlistment, was restless after a year of transition and yearned for travel and action. Her current husband had previously served as a captain in the U.S. Army, but her main inspiration for joining was the admiration she developed for the military while working for the American embassy in Bogota, Colombia, she said. Her daughter, Sgt. Zolman, studied at a military school in Colombia before completing her high school degree in the U.S. Like many 18-year-olds, Zolman struggled with the prospect of financing college and wanted a more promising career trajectory. She also cited her father’s work as a former lieutenant in the Colombian army as a major influence on her decision to enlist. Neither Zolman nor Godwin has experienced any impediments toward growth and development as females in the Army. Driven by her step dad’s airborne service and determined to be successful, Zolman is an airborne Soldier and considers officer school a possible future pursuit. On her experiences as an older female Soldier, Godwin explains that she has received nothing but respect. With a PT score of 366 from basic training, Godwin rivals many of her male counterparts. Although they shared duty stations for basic training and the Army’s advanced individual training, their military paths have not crossed until now. Godwin was previously stationed in Fort Carson, Colorado, the launch pad for her one-year deployment to Afghanistan. Her daughter, who arrived here in January after five years at Fort Bragg, North Carolina, coincidentally received orders to Grafenwoehr.